Buy Rizopia Organic Gluten Free Brown Rice Penne in the UK from our online shop or directly from our independent Scottish store. Rizopia all-natural penne pasta tubes are ridged, hollow and cylindrical in shape making them the ideal accompaniment to thick sauces. 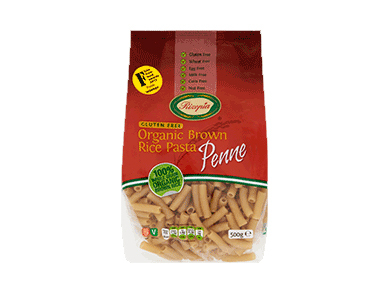 Where can you buy real Brown Rice Penne safely online? If you are wondering where you can buy Rizopia Organic Gluten Free Brown Rice Penne safely online in the UK, then shop with us. Brown Rice Penne - Rizopia Organic Gluten Free Brown Rice Penne in Gluten Free Pasta and Dried Pasta.